Every year, all across the planet, one baby boy out of every 3,500 born is afflicted with an incredibly rare and horribly debilitating condition known as Duchenne Muscular Dystrophy. One foundation, the Association Monégasque Contre les Myopathies, or Monaco Association against Myopathies, has been leading the way in the research required to combat this terrible affliction. Frédérique Constant is a passionate supporter of charitable causes, and especially those affecting children. For the past seven years, Frédérique Constant has been an active participant in an event known as “Only Watch”, whose sole purpose is to raise funds in support of the centre carrying out this vital research. We are proud to announce that in 2013, we will be continuing our avid support for this exceptionally worthwhile cause, when we will be contributing a specially designed and totally unique watch and jewellery collection for the auction held to raise the crucial funds. This year’s auction will be held on September 28, in the glamorous setting of Monaco’s spectacular Hôtel Hermitage, and once again, Frédérique Constant will be there. Our unique, one-of-a-kind timepiece for Only Watch 2013 will be based on the iconic Double Heart watch and jewellery collection. 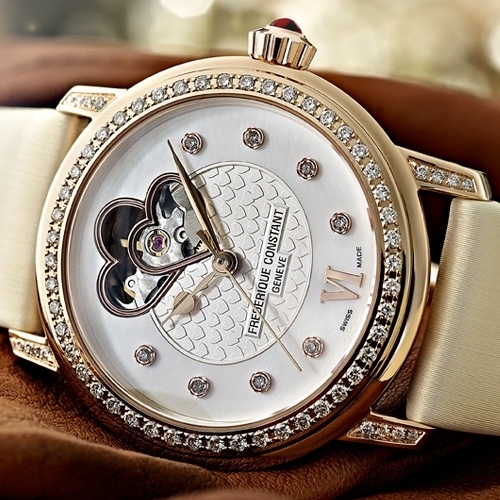 Frédérique Constant is donating a unique “Double Heart Woman Set” composed by a unique Lady Automatic Double Heart Beat timepiece with a dazzling 19 carat rose gold case “pavé” with sparkling diamonds. On the case back, there is a hand engraved reminder of the reason the watch was created by our finest craftsmen. “Only Watch 2013” has been engraved, and this beautiful and utterly unique timepiece will be presented in a specially designed leather gift box. In addition to the elegant and feminine watch, Frédérique Constant has created a beautiful, matching three-piece jewellery set to complement the Only Watch 2013 timepiece. The successful bidder will also be receiving a delicate and attractive pendant, bracelet and matching pair of earrings. All three pieces are finished in the same 18-carat rose gold, creating the perfect ensemble for that special evening out.